Whether you will participate in the HMO or Out of Area option will depend on where you live. The HMO Blue New England plan covers members who live in certain geographical service areas, including all cities and towns of Massachusetts, Rhode Island, Connecticut, Maine, New Hampshire and Vermont. If you are a TeamstersCare member living outside of New England, or a member with an eligible dependent living permanently outside of New England, you are covered by Blue Care Elect Preferred. When you enroll in HMO Blue New England, you and each family member must select an in-network primary care physician (PCP). Your PCP will direct and monitor your care, and will be the first person you call when you need routine or sick care. They will also guide you through any referrals you may need for specialized services. In an emergency, such as a suspected heart attack, stroke or poisoning, you should go directly to the nearest medical facility or dial 911 (or your local emergency phone number). 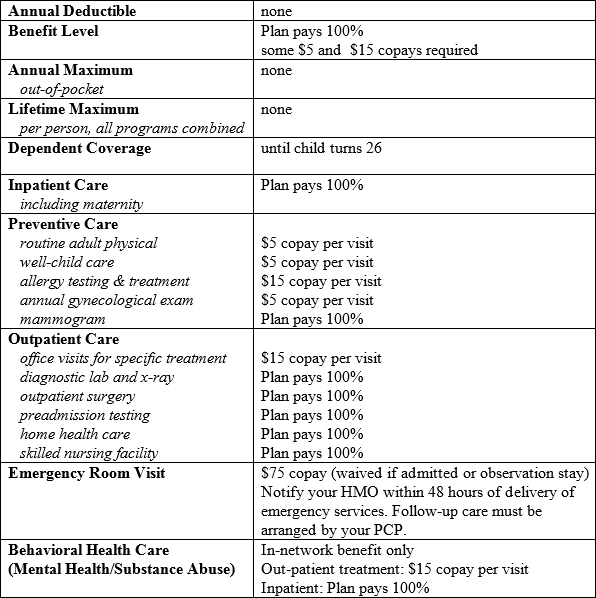 You’ll pay a $75 copayment for emergency room services, though this copay is waived if you’re admitted to the hospital. *Check with HMO Blue New England for (1) limitations that might apply to services listed above or (2) coverage of any items not identified above. Important Note: This summary is not meant to be a complete description of your TeamstersCare benefits. For eligibility related issues, or if you have any questions, call Charlestown Member Services. As a Blue Care Elect Preferred Member, you are not required to select a Primary Care Physician (PCP). Instead, you and your dependents have two basic options for care: (1) you can take advantage of discounted services by using a Blue Care Elect Preferred Provider or (2) you can use a non-network provider. If you use an in-network provider, the cost of most services (less any copayment) will be covered in full. 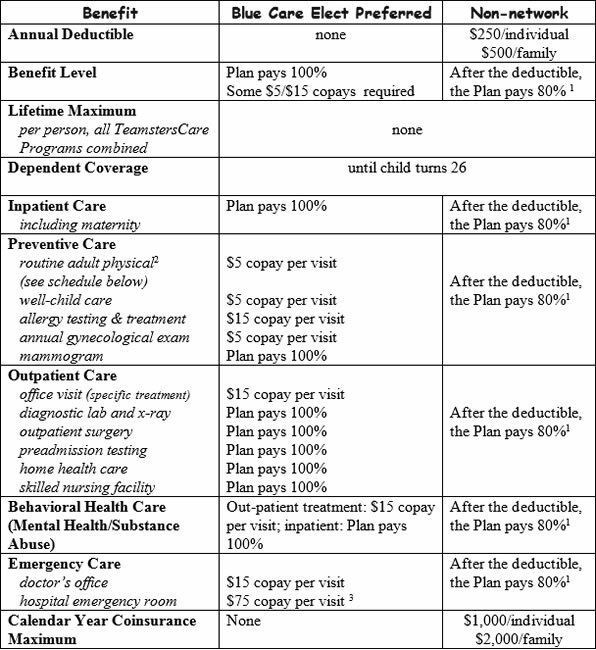 If you use a non-network provider, most expenses are covered at 80% of reasonable and customary amounts after a $250 individual/$500 family deductible. The out-of-network co-insurance maximum is $1,000 per individual/$2,000 per family. For more information on the Blue Care Elect Preferred Provider network, call 1-800-810-2583 or visit http://www.bluecrossma.com/nm/teamsters-care/. (1) of reasonable & customary expenses for covered charges. If the provider’s actual charges are greater than the usual and customary charge, the member will be responsible for the applicable cost sharing amount based on the usual and customary fee, plus the difference between the usual and customary fee schedule and the provider’s actual charges. (2) one routine visit every five calendar years from age 19 through 29, one routine visit every three calendar years from age 30 through 39, one routine visit every two calendar years from age 40 to 54 and one routine visit per calendar year when age 55 or older. Important Note: This summary is not meant to be a complete description of your TeamstersCare benefits. For a detailed listing of Blue Care Elect Preferred providers and facilities in your area, call 1-800-810-2583 or click here. For more information on specific coverage under the Blue Care Elect Preferred option, claims-related questions, limitations that might apply to services listed above and coverage of any items not identified in this chart, call 1-800-241-0803. Your Blue Cross Blue Shield medical benefit includes counseling and treatment for emotional difficulties, mental illness, substance abuse, family and marital problems and childhood concerns. You also have access to a variety of programs and services to help with chronic behavioral conditions. To access outpatient behavioral health services, you simply make an appointment with an in-network provider and pay a $15 copay at the time of your visit. No referral or pre-authorization is necessary. For new episodes of outpatient care, the first 12 visits are automatically authorized. If more than 12 visits are needed, your in-network provider will contact Blue Cross Blue Shield for additional authorizations on your behalf. If you or your dependents have questions, you may call the Blue Cross Behavioral Health Coordination line at 1-800-444-2426 or go to http://www.bluecrossma.com/nm/teamsters-care/. Important Note: As a TeamstersCare member, you also have access to behavioral health services through our in-house Employee Assistance Program.